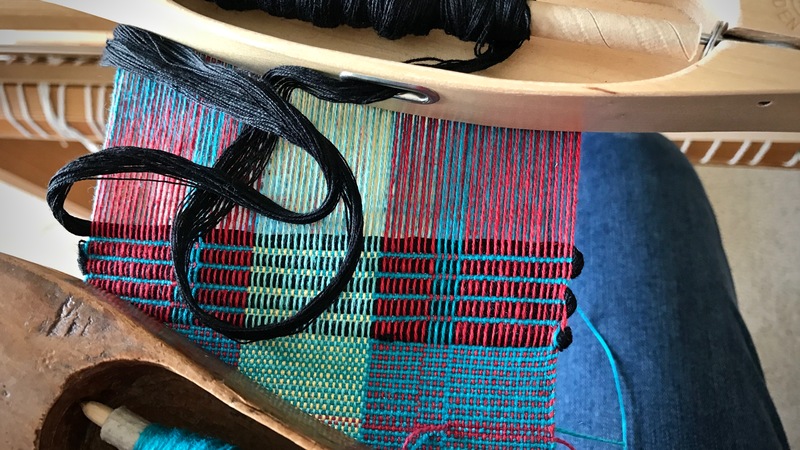 Those pesky string yarn weft tails! There is a lot of starting and stopping with these mug rugs. 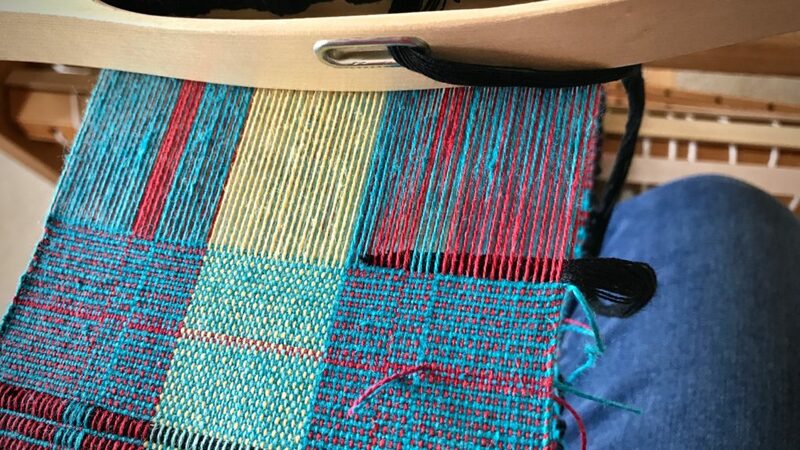 Normally, tucking a weft tail back into the shed adds a bit of extra thickness at the selvedge. 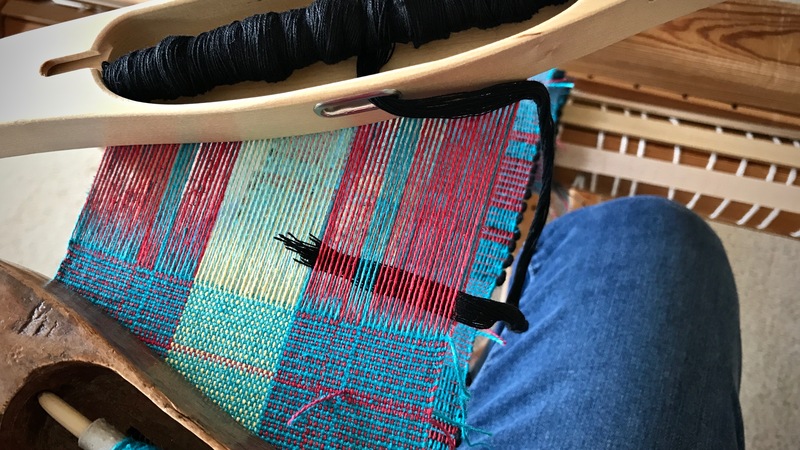 So, what about this very thick weft? It has the potential to throw everything off balance. 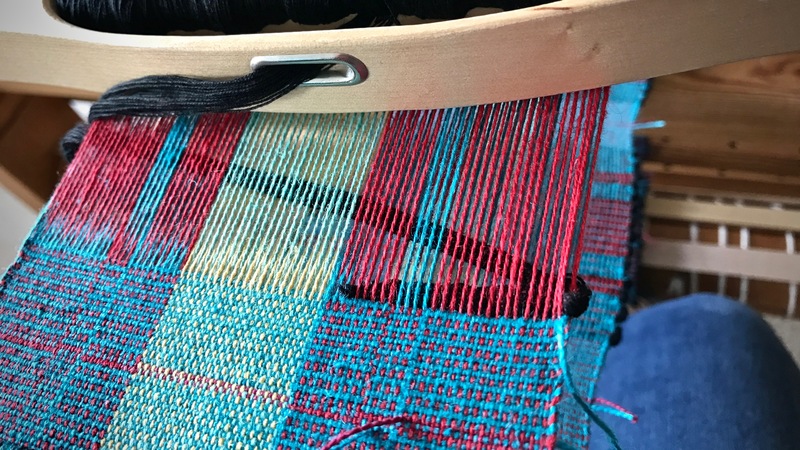 A few easy tips help minimize the distortion the thicker weft can cause. Begin the thick weft on alternating sides. This will prevent one selvedge from building up more than the other. Taper the end of the string yarn, cutting it at a steep angle. Starting about 1 3/4″ inside the selvedge, send the shuttle through the shed toward the selvedge, going over or under the outermost warp end. Pull through until almost all of the weft tail is caught. Starting the shuttle from the inside, going outward, is an easy way to catch all the separate threads of the string yarn. In same shed, send the shuttle back through to the other side, aware of encircling the one warp end. To end the thick weft, leave a 1 3/4″ tail, and taper the end of the string yarn, as before. Lay the tail back in the last shed, going around the outermost warp end. Beat. Things happen that throw us off balance. From personal celebrations to unexpected losses. Don’t be afraid. Putting trust in the Lord minimizes the inner turmoil. The Lord is my light. He lights my way. What is there to be afraid of? Wholehearted trust in the Lord pushes fearfulness away. May you walk in a lighted path. Just wanted to say congratulations on another great project and article in the newest Handwoven Mag! I’m so proud of you! Thanks for all you hard work and help with our weaving! Hi Liberty, Thank you so much! 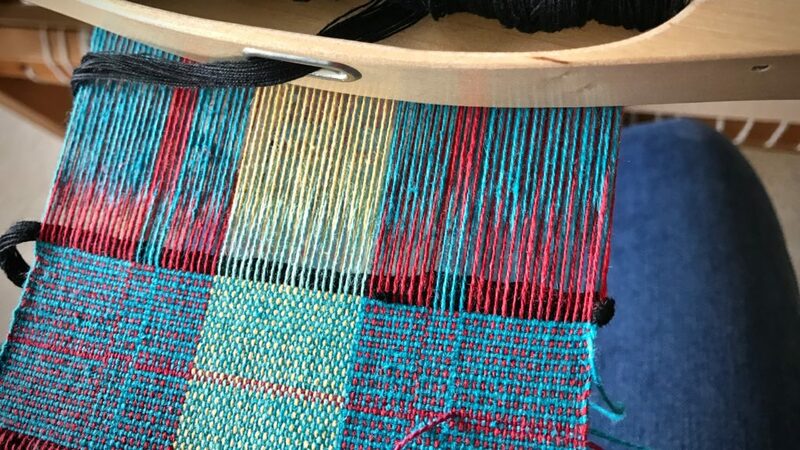 It’s my joy to add my little two cents to the whole wide weaving world. My copy came in the mail yesterday! There are a lot of great projects in there. Purple table runner and ordered the supplies to make it right away, although in cotlin instead.